Real estate brokers love to call their listings “one of a kind,” but there’s a property that’s just hit the market in Indiana that is truly like no other. The entire town of Story, Indiana is up for sale for the first time in 20 years, according to the New York Post. Owner Rick Hofstetter is asking $3.8 million. Story was founded in the mid-1800s by Dr. George Story. It was once a bustling lumber town, but it was hit hard by the Great Depression and never fully recovered, according to the Times. Hofstetter purchased the town in 1999. The old-fashioned 17.4-acre village is about an hour drive south of Indianapolis. 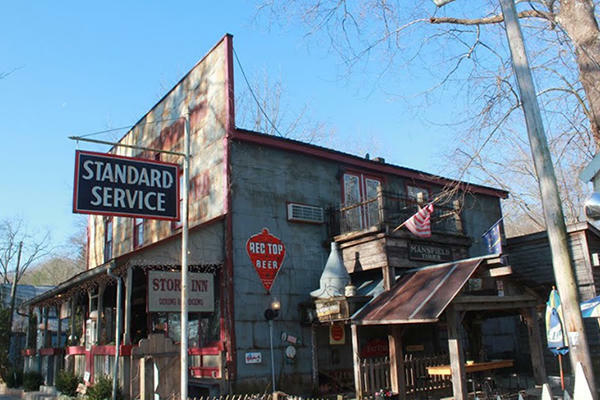 It has about a dozen buildings and a population of just three people (plus a rumored ghost) and four dogs, but Hofstetter has helped make it a popular vacation destination by starting a bed-and-breakfast called the Story Inn and preserving old buildings to be used as event venues. Jacob and Kate Ebel, who co-own the inn with Hofstetter, say they employ up to 50 people at the height of vacation season and claim to hold about 45 weddings each year at the property. The Inn also hosts the annual Indiana Wine Fair. It’s the only property in Story that isn’t up for sale, but Hofstetter said the Ebels will pay rent to the town’s new owner.